Going for a vacation down under is certainly a lot of fun as it has things and experiences to offer which no other country in the world does. We spend most of our budget in looking and staying at a place which is way too costly. Since we end up spending most of our funds on our stay in a new country, we are barely able to afford the more enjoyable things during our traveling expedition and end up not seeing or experiencing half the things that the country has to offer. Therefore, in order to be able to spend time on visiting and experiencing adventures that Australia has to offer us, we need to start looking for places, hotels, motels or hostels which provide us with a great amount of comfort in a considerably low-budget. This is one of the hostels in Australia which is recommended by a number of websites online because of its party-like nature and environment. If you are looking for a place with people who have a party mindset, then this is the right place for you. Starting from about $18 per night, this place proves to be one of the best hostels in Queensland, Australia. It is a hyperactive party place and has a good amount of outdoor space. There’s also a 25m swimming pool for everyone staying at this hostel. It includes various fun activities such as DJ nights, karaoke, quiz nights and also offers free Wi-Fi to its guests too. This beach house is set in a historic building in South Australia. Located in the center of Fleurieu Peninsula, it used to be a stunning building of history before it was renovated into this breezy beach house. The beach house offers free parking and also offers a 270 degree view of the beach and surrounding landscapes. You will be able to find every kind of room here, ranging from single to shared as well as family rooms. These rooms are also within budget and they start from about $25 per night. The hotel also offers everybody staying there a fantastic self-catering kitchen as well as a lounge to relax and socialize with the others. If you are on a tight budget, but do not want to stay in a hostel, then you may want to check out Desert Cave Hotel. 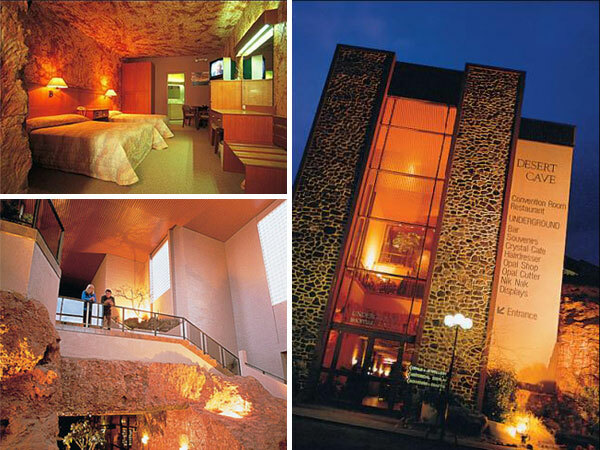 Located in Coober Pedy, you can choose to stay either in the unique desert underground accommodation or simply the upper ground one. You are also provided a relaxed outdoor swimming to cool off in. The hotel also offers a great restaurant to suit your tastes. Every guest room offered by the hotel is entirely furnished and you will be amazed to find all sorts of modern amenities inside. With free WiFi and a quick airport shuttle service, this hotel turns out to be the best option if you can open your pockets slightly more. The rooms here are offered for about $114 per night. Since this price is considerably higher than that of a hostel, you can do a small internet research and easily Find Cheap Hotel & Travel Deals Online to suit your budgets, hassle-free. If you choose to visit the great ocean road, this hostel would be your best choice in the area. ECO YHA gives you the perfect opportunity to explore this amazing region while spending minimum money on your accommodation. The place offers communal self-catering kitchens as well as lounges where you can relax and simply enjoy the surroundings of the area. You are also offered a TV and reading room so if you are not planning on going sightseeing, you can simply sit down and enjoy the company of some great books. Apollo Bay also provides for a rooftop on the building which offers breathtaking views of the region and a BBQ for you to cook some nice and tasty Aussie meals. You can choose between a variety of rooms offered by this hostel such a twin or multi-sharing, family rooms or single rooms by yourself. The hostel is located just 2 minutes walk from the nearby cafes and restaurants as well as other attractions in the region such as national parks. If you are visiting with a large group, you can also book the entire hostel. Located at 500 meters from the Four Mile Beach, this amazing resort offers a heated swimming pool to all of its guests. It also offers a fitness center and a nice poolside bar as well. All renowned cafes, restaurants and other attractions are located within 15 minutes walking distance from the resort. Every single room at the Pink Flamingo Resort are supplied with a kitchen, air conditioning, TV as well as a private bathroom. The guests are offered superior facilities which include villas that have their own massage areas as well as an outdoor soak. The resort also helps guests in managing and booking barrier reef visits, helicopter rides as well as fishing tours. Another great part about this resort is that it is pet friendly. The villas at this resort start from about $102 per night. Where do you like to stay when you go to Brisbane? Please share with us in the comments below.